Print-Track® Plus™ software integrates seamlessly with Tekvend controllers to provide a flexible array of "Pay for Print/Copy" solutions. With these products, it's never been easier to pay for prints or copies with money or magnetic card credit. Ideal for libraries large and small, educational computer labs, internet cafes, and real estate offices, Print-Track Plus tracks, accounts for, and vends print jobs sent either from any type of client PCs to commonly shared, but paused printers ("Monitor and Pause" printers). If Print-Track Client™, a popup utility, is installed on a particular client PC (making it a reporting client), users are required to enter a temporary secure password of a minimum length when printing to a "Monitor and Pause" printer. The temporary password keeps a user's print jobs secure from the prying eyes of other users. 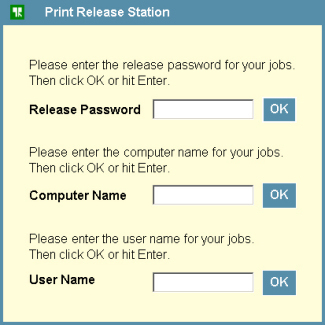 Jobs secured by password can only be "found" and printed by the sender at a print release station PC. Reporting client PCs can be private, no-job-review, public, or non-reporting. Jobs sent from private clients to "Monitor and Pause" printers print for free, possibly against one or two accounting codes. Jobs sent from no-job-review clients to "Monitor and Pause" printers also print for free, but no accounting codes are neded. Jobs sent from public clients to "Monitor and Pause" printers must be paid for, using either cash or magnetic card value. Jobs sent from non-reporting clients to "Monitor and Pause" printers either print for free, or against cash or card value, according to a setting on the print server. Jobs sent from non-reporting clients are not secured by a password, but can still be "found" at a release station by the Logon or Computer Name fields. For Windows PCs, the Computer Name is its netbios name; for Mac and Linux clients, the computer name is the last three digits of the client's IP address. Tekvend controllers vend print jobs, copies, or both. Click on the flow chart to the left to see how this process works. 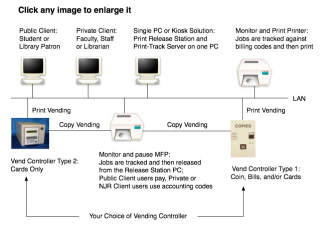 For the vending of both copies and prints, if the destination copier/printer (MFP) is in copy or bypass mode, print jobs cannot be released. If however the destination MFP is in serial or printing mode, the controller's copy and bypass modes are inhibited. For MFPs supporting Mode B protocol, up to six copy type prices are supported. 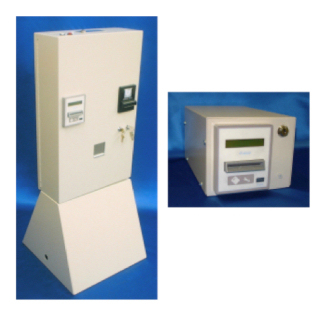 Tekvend supports vending of color and B/W copies for Xerox, Toshiba, Ricoh Aficio, Kyocera Mita, Sharp and others. Tekvend coin-op (cash based) controllers use SmartCoin™ technology. This technology automatically calculates how much change is available for a transaction, and therefore which currency denominations (coins and bills) can be accepted. Large bills may held in escrow for return, if change available is low. Furthermore, you can decide how much change you are willing to return over the value of a specific transaction. Specific currency types can be universally disallowed. For example, you may wish to never accept twenty dollar bills. 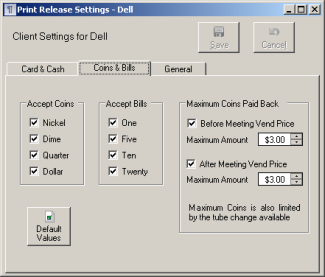 Print-Track responds to Windows Regional Settings for currency symbols, and Tekvend controllers automatically detect different currency "weightings" (how many multiples a particular coin or bill is, relative to the smallest coin accepted). Tekvend coin-op controllers that utilize cards (M7xxx series) can be adjusted to accept "only cash" or "only cards" for two overlapping price ranges. 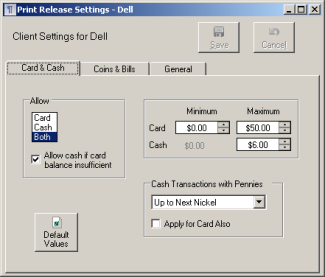 For example, users can use cards to vend print jobs of any price, but can use cash for print jobs only up to a certain value. Copy or print card vends can be priced to the penny, with cash vends priced to the nickel, using one of three rounding rules. "Card then cash" copy and print vends are allowed, with excess credit always written back to the card and never returned as change. Cards can be revalued with cash anytime, even outside of a vend transaction. Cash deposits for copying are determined separately from cash deposits for printing. Any errors associated with print vending are logged at the server for easy complaint resolution, plus incorrectly printed jobs can be reprinted, thereby avoiding returning any funds deposited for printing. 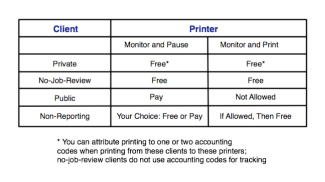 Users at private, no-job-review and (possibly) non-reporting clients can print to both "Monitor and Pause" and "Monitor and Print" printers. See the table to the left.